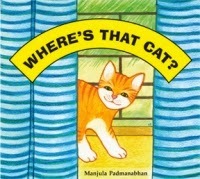 Little Medha Growing Up: Book Review : Where's that cat? Last week, we are talking about Farm Animals a lot, then I was searching for some simple books that involved animals, then I came across this simple yet beautiful book from Tulika Publishers. The cover is pretty simple a picture of an innocuous orange cat looking out of the curtain and I am sure every one will like the text with humorous illustrations. Title : Where's that Cat? The story is all about a cute little girl, Minnie, comes home from school and can’t find her pet cat Pooni. She goes into the garden but Pooni doesn't come when she’s called! Minnie asks people all along the action-packed street if they've seen the cat. Minnie is upset as she couldn't find her Pooni. As per teacher advice, she returns back to home with sad face. By the end there is general relief from everybody both inside and outside the book. Pooni has the last word – “Prrr” – and the final illustration shows Minnie cuddling Pooni, who is no doubt completely unaware of the trouble she has caused. The characters are native – from the parrot lady, the auto driver, the aged couple, the school girls, the vegetable seller, the lady in a nightdress buying vegetables and the cow happily munching the ‘Vote For’ poster! 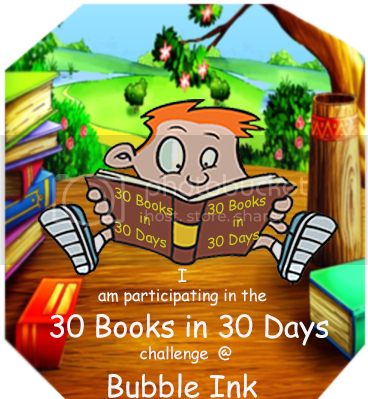 Each and every character in the pictures draws attention of kids. Love between a pet and girl.